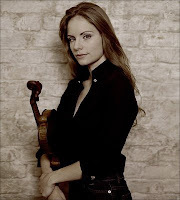 Julia Fischer is a German violinist, pianist, and teacher born on June 15, 1983 (Perlman was 38 years old). She was a child prodigy. Fischer began her violin studies at age 4. At age 9, she entered the Munich Academy of Music where she studied with Ana Chumachenco. At age 12 (1995), she won the International Yehudi Menuhin Violin Competition. She began concertizing soon after. She made her Carnegie Hall debut in 2003. It has been publicized that to honor the 250th anniversary of Mozart’s birth, Fischer played on Mozart’s own violin (a Pietro Antonio Dalla Costa) in Salzburg. Her discography is fairly extensive already and her reviews are always full of superlatives. Her recordings of Prokofiev, Glazunov, Mozart, Tchaikovsky, and Bach have won accolades from reviewers. She plays with a ferocious technique but an unpretentious, alluring sound. YouTube has many videos of her performances. A little over a year ago, Fischer played Grieg’s piano concerto in Frankfurt, Germany. On that occasion, she also played the B minor violin concerto by Camille Saint Saens. Fischer uses a Guadagnini from 1742. She is also currently teaching at the University of Frankfurt. Unfortunately, she has a reputation for being very rude and arrogant with colleagues.